Today, in my continuing series of posts about dance masks from the Mexican state of Michoacán, I will present Perro (dog) masks from Cuanajo, a Purépecha town near Patzcuaro, Michoacán. In that town there was a local tradition in the mid-20th century of dancers wearing dog masks during Carnaval (Mardi Gras). This was apparently a custom that later died out, because contemporary YouTube™ videos of Carnaval there don’t seem to reveal any dancers portraying dogs. 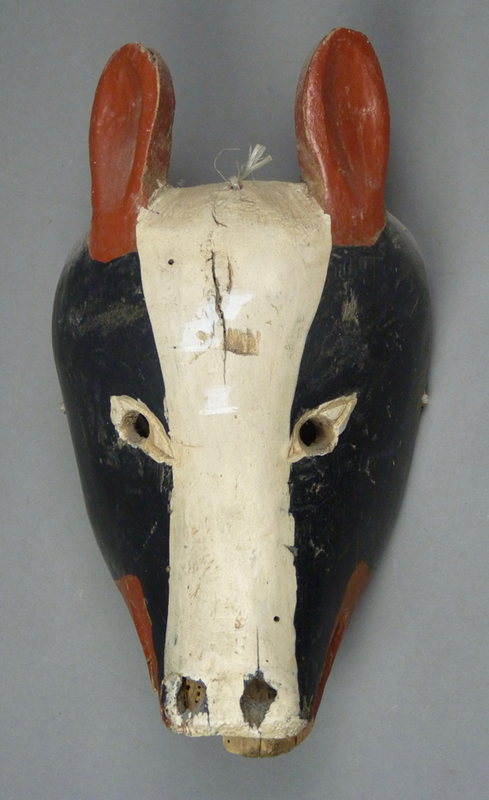 In her book, Tigers, Devils, and the Dance of Life: Masks of Mexico (1999, page 88), Barbara Mauldin included a photo of two of these Perro masks from Cuanajo that date to about 1965. I will show you three more from my collection. 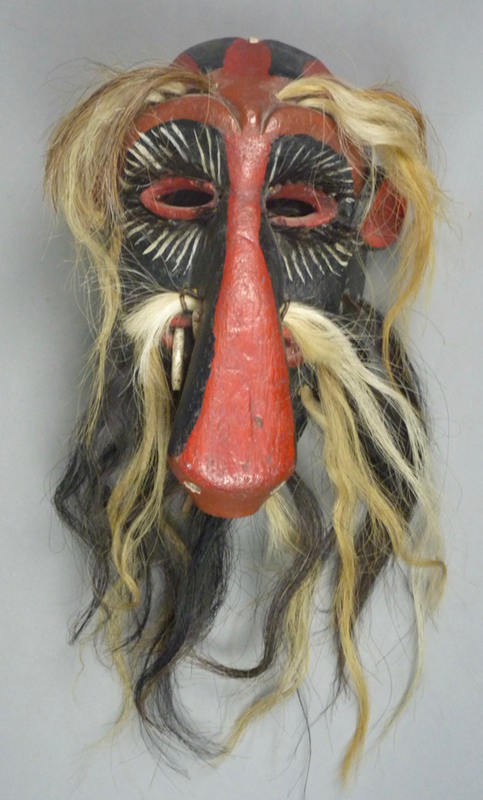 I purchased this mask and the next from Robin and Barbara Cleaver, of Santa Fe, in 1987. Indeed, these were among my very first Mexican masks. A distinctive design aspect of the Cuanajo dogs is their ears. These three also have virtually the same dimensions. In last week’s post I showed a group of Feo masks from a Toritos dance in Paso Ancho, Michoacán, including one with an outrageously oversized nose that I purchased in 1987. I included a recent video of Paso Ancho Feos misbehaving, to demonstrate that one of those dancers wore a mask with just such a nose. Today I will show three more masks from Paso Ancho with oversized phallic noses—a trio of Feos. I consider these masks to be fabulous, so I was overjoyed to be able to buy them from Kelly Mechling (in New Orleans), back in 1994. He had obtained them from Jaled Muyaes and Estela Ogazón. Jaled actually had a photo hanging in his living room that was taken by some famous photographer, which showed him (Jaled) looking at one of these phallic masks that was displayed on a wall. Then I will follow with two clown masks from nearby Charo, Michoacán that were used in a similar dance in that town—El Viejo y El Toro (the Old Man and the Bull). Estela Ogazón had included a photo of such a Viejo mask in her book, Máscaras (1981, plate 34), and documented the name of the dance. Although one does find contemporary videos on YouTube™ of elaborate straw mat bulls in Charo, one does not find videos that show these latter masks in current use. They are apparently no longer in fashion. Here is the first of the trio of phallic Feos. The nose has the form of a snake. In recent months I have described masks used in Purépecha (Tarascan) communities of Michoacán. In this post and one that follows I will shift to masks from a traditionally Matlatzincan Indian community in Eastern Michoacán, Paso Ancho. Paso Ancho lies about thirty miles east of Pátzquaro in a fairly remote area. At some time in the late 20th century a paved road was constructed to connect this town to the county seat to the north, Tzitzio, and thence to Charo and then Morelia, the capital of Michoacán. This road opened Paso Ancho to the wider world, permitting Jaled Muyaes and Estela Ogazón access to this interesting, traditional, and previously hidden area. There they collected the five masks that we will examine in today’s post. There is a traditional masked dance in this region, La Danza del Torito. The bull in this dance has traditionally been called a torito de petate or “straw mat bull,” meaning a bull effigy constructed from a wooden frame that has been covered with a woven sleeping mat. This bull is a body mask, which is animated by a dancer who runs while carrying the frame on his shoulders. The dance features the interaction of the bull with a group of clowns who function as feos (uglies), by performing comic and occasionally obscene behaviors. Here is a recent YouTube™ video from Paso Ancho that reveals the persistence of this dance and its masked dancers. Their Torito appears to be covered with painted fabric. I obtained most of these masks in the late 1980s from Robin and Barbara Cleaver. All five had probably been collected by Jaled and Estela 10 or 20 years earlier. As you may notice, there are very similar masks in the video. The first is a human faced mask with a long phallic nose and exaggerated lips. 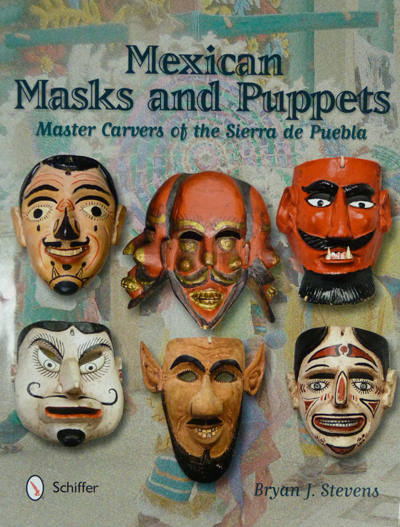 A second “korkobi” mask on page 261 of the INAH catalogue is misidentified in my opinion, and can be found also on page 49 (plate 42) of Moya Rubio’s book, Máscaras: la Otre Cara/ Masks: The Other Face (third edition, 1988), where it is described as a Moro from the state of Guerrero. To my eye, this appears to be a decorative mask. 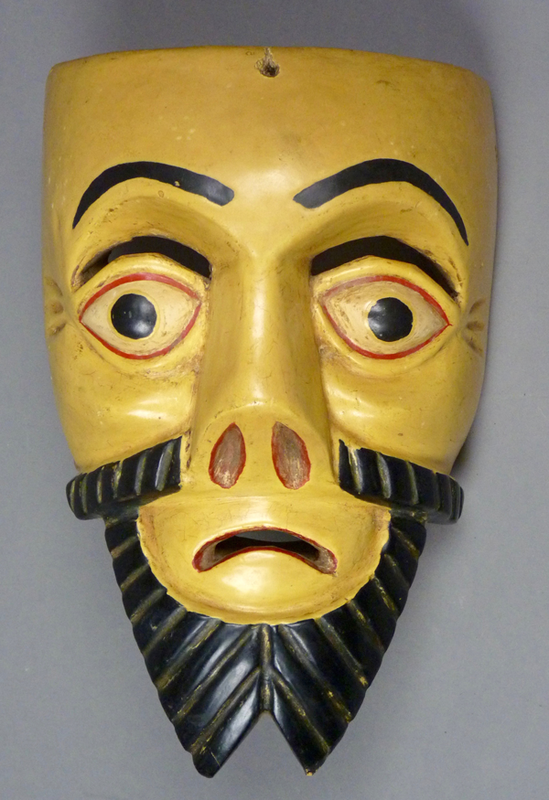 Here is a Corcovi mask that, although unmarked, is easily recognized as the work of Victoriano Salgado Morales of Uruapan, Michoacán. I bought this mask on EBay™ in 2010. 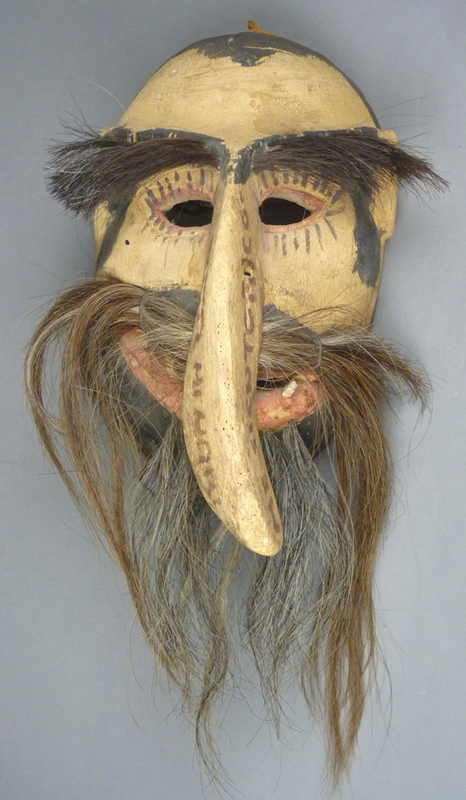 The more recent of the two Corcoví masks in Cordry’s book looks very much like this one.